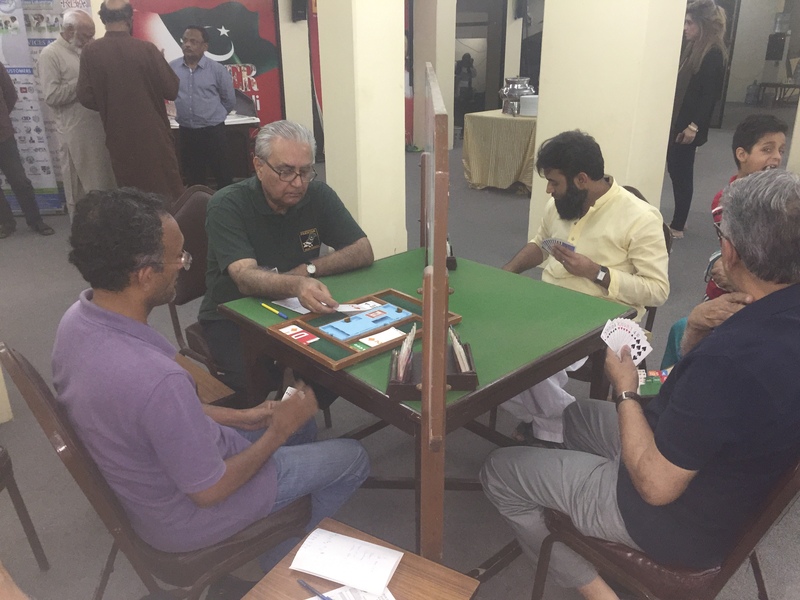 In the recently concluded KBA Bridge Teams Tournament 2018, comprising of 9 Round Complete Round Robin Movement was played at the Aslam Bridge Hall Karachi on 24th and 25th February 2018. 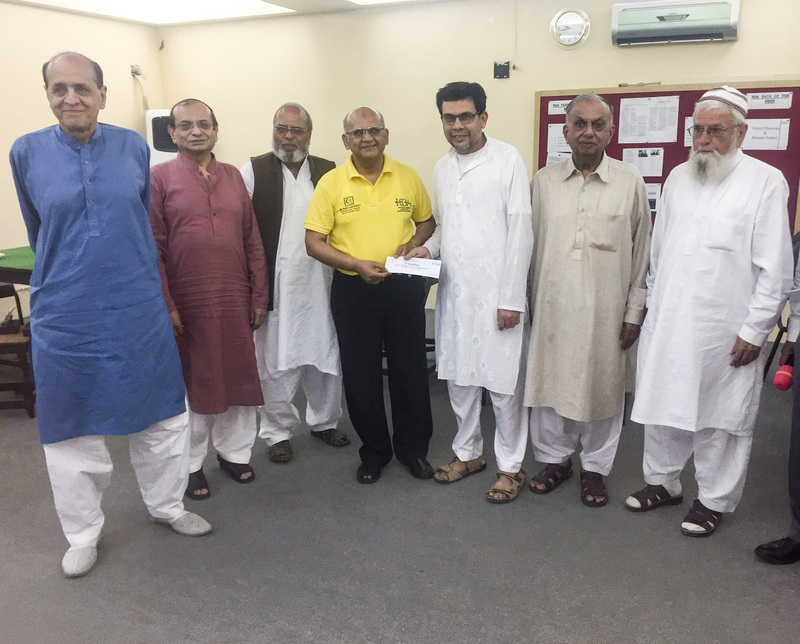 The team Puri Real Estate won the Tournament with a score of 133.92 having the services of Tehsin Gheewala, Hassan Askari, Mubashar Puri, Hamid Mohiuddin, Ziaullah Beg & Khaled Mohiuddin. 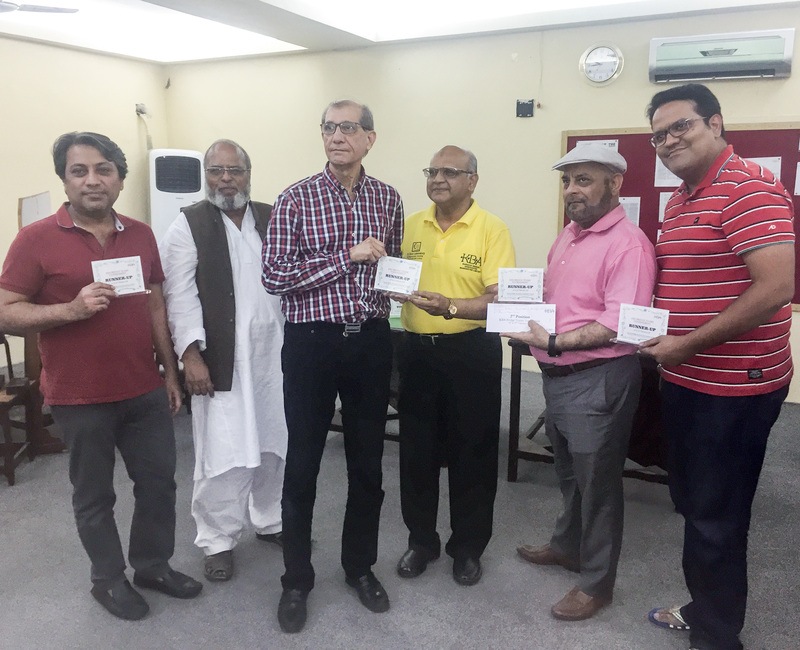 The First Runners up position went to Bilal at a score of 118.72, comprising of Gulzar Bilal, Farrukh Liaquat, Anwar Kizilbash, Anisur Rehman and Mohsin Chandna. 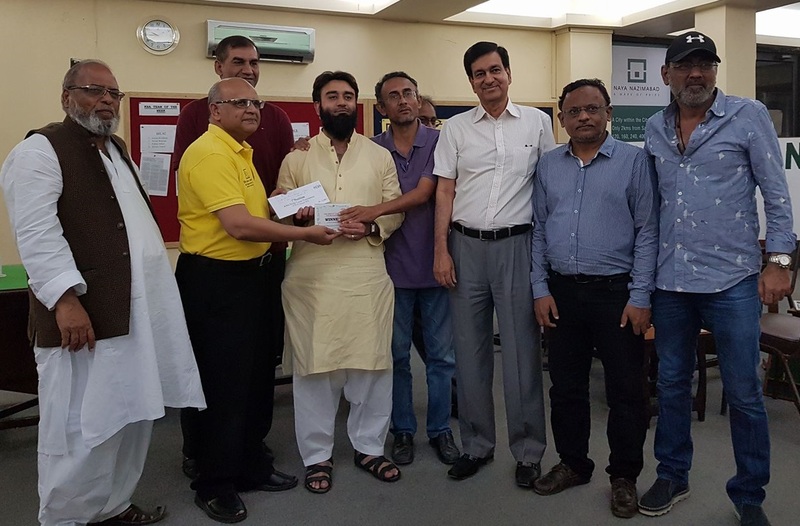 The 3rd position went to Karachi Aces at 101.91, comprising of Ghulam Mohammad, Nasir Raza Khan, Ashraf Kothari, Hussain Jaffer, Asghar Abbas, and Yawar Abbas.
! Tbl  Team                                     IMP        Score     !
! 1   2 Six Stars         9 Farhat            33-29    11.50  8.50  !
! 2   3 Karachi  Aces     8 Puri Real Estate  11-39     2.49 17.51  !
! 3   4 Masood            7 KBA-IV             3-42     0.90 19.10  !
! 4   5 Bilal             6 Rubina            51- 9    19.44  0.56  !
! 1   1 Rahmi-V           9 Farhat             2-30     2.49 17.51  !
! 2   2 Six Stars         8 Puri Real Estate  15-26     6.28 13.72  !
! 3   3 Karachi  Aces     7 KBA-IV            31-11    15.97  4.03  !
! 4   4 Masood            6 Rubina            19- 0    15.75  4.25  !
! 1   1 Rahmi-V           8 Puri Real Estate   9-69     0.00 20.00  !
! 2   2 Six Stars         7 KBA-IV            26-26    10.00 10.00  !
! 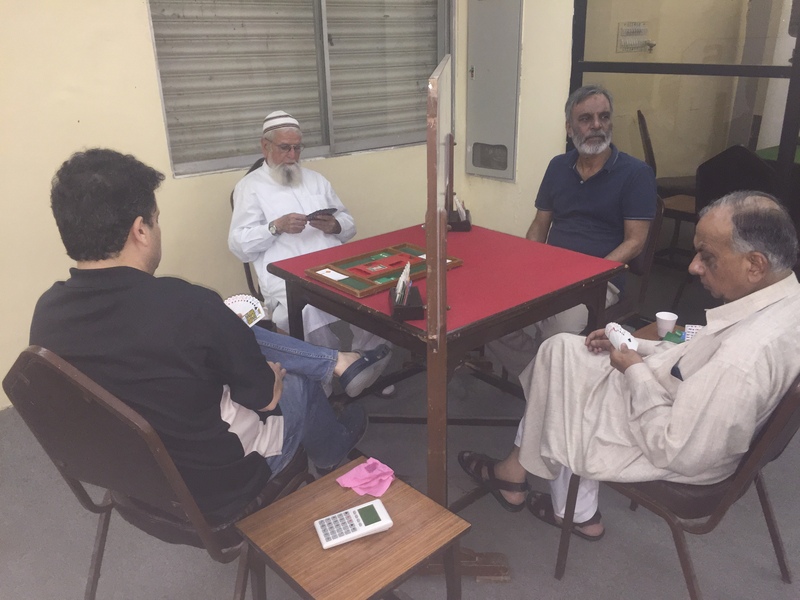 3   3 Karachi  Aces     6 Rubina            16-39     3.41 16.59  !
! 4   4 Masood            5 Bilal              2- 5     8.86 11.14  !
! 1   1 Rahmi-V           7 KBA-IV            36-11    16.97  3.03  !
! 2   2 Six Stars         6 Rubina            49-15    18.44  1.56  !
! 3   3 Karachi  Aces     5 Bilal             33-20    14.28  5.72  !
! 4   8 Puri Real Estate  9 Farhat            11-10    10.39  9.61  !
! 1   1 Rahmi-V           6 Rubina            25-17    12.83  7.17  !
! 2   2 Six Stars         5 Bilal             25-31     7.82 12.18  !
! 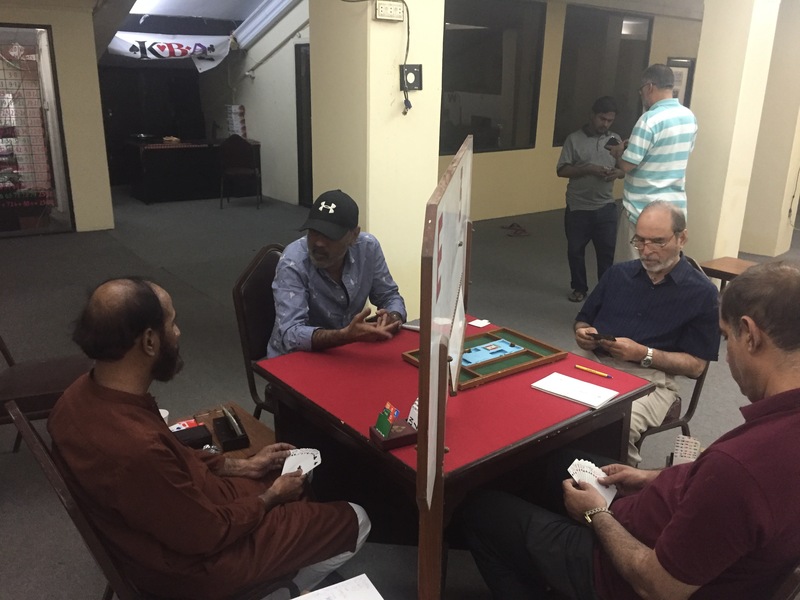 3   3 Karachi  Aces     4 Masood            12-21     6.86 13.14  !
! 4   7 KBA-IV            9 Farhat            11-27     4.95 15.05  !
! 1   1 Rahmi-V           5 Bilal              8-40     1.85 18.15  !
! 2   2 Six Stars         4 Masood            22-19    11.14  8.86  !
! 3   6 Rubina            9 Farhat            22-17    11.85  8.15  !
! 4   7 KBA-IV            8 Puri Real Estate   2-26     3.22 16.78  !
! 1   1 Rahmi-V           4 Masood            11-24     5.72 14.28  !
! 2   2 Six Stars         3 Karachi  Aces      0-39     0.90 19.10  !
! 3   6 Rubina            8 Puri Real Estate   1-45     0.34 19.66  !
! 4   5 Bilal             9 Farhat            30-23    12.51  7.49  !
! 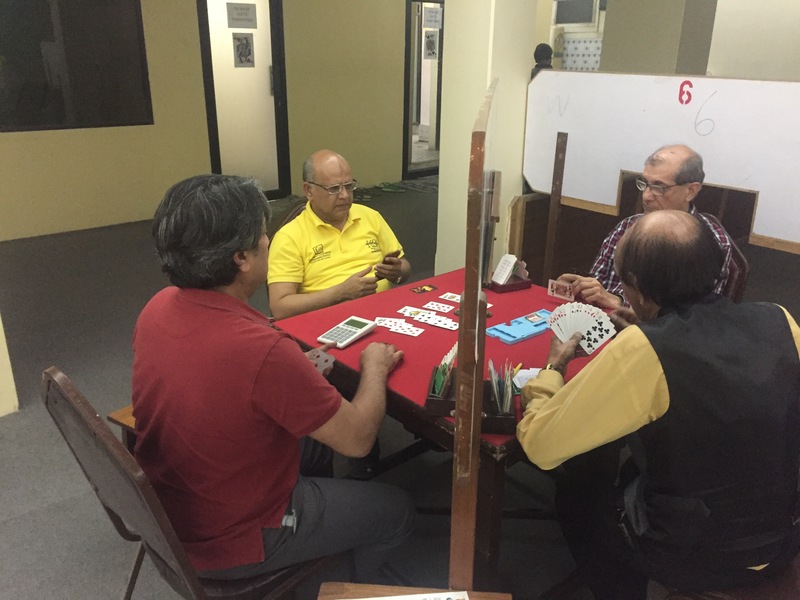 1   1 Rahmi-V           3 Karachi  Aces     20-37     4.71 15.29  !
! 2   6 Rubina            7 KBA-IV             0-25     3.03 16.97  !
! 3   4 Masood            9 Farhat            30-14    15.05  4.95  !
! 4   5 Bilal             8 Puri Real Estate  18- 4    14.54  5.46  !
! 1   1 Rahmi-V           2 Six Stars         27-18    13.14  6.86  !
! 2   3 Karachi  Aces     9 Farhat            30-23    12.51  7.49  !
! 3   8 Puri Real Estate  4 Masood            22- 4    15.52  4.48  !
! 4   7 KBA-IV            5 Bilal              6-11     8.15 11.85  !